﻿ Age of Civilizations II - How to Make Your Economy Strong? Home » Guides » Age of Civilizations II - How to Make Your Economy Strong? 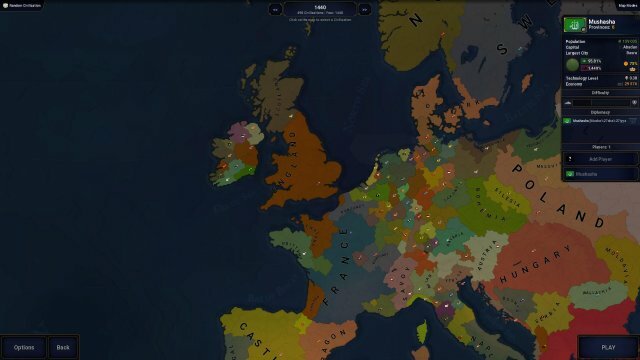 Age of Civilizations II - How to Make Your Economy Strong? This guide helps you build a strong economy and eventually win the game by throwing numorous money at everything. One of the two ways to gain a good income is to cut your unnessary expenses (such as the military maintanece fee) off. However, this comes as a drawback that you are now vulunable to other civs and AI may initiate a war against you. And remember, war is always bad, and especially if the battle goes on your land. It will drain your treasury pretty fast and lower the economy in the warzone. Never, never let a battle goes on your land. End the war as fast as you can. To overcome this, you need to pick up a good starting location. Take 1440 scenario as an example. Bavaria and Saxony dont seem to be a good starting kingdom. On the other hand, scotland has a good starting position and is not surrounded by multiple kingdoms. This makes it easy for them to deal with the several neighbors and maintain a good relationship when you have limited diplomatic points and no army. Then we need to consider how to boost your economy up. Your income comes in two majoy ways: tax and production. 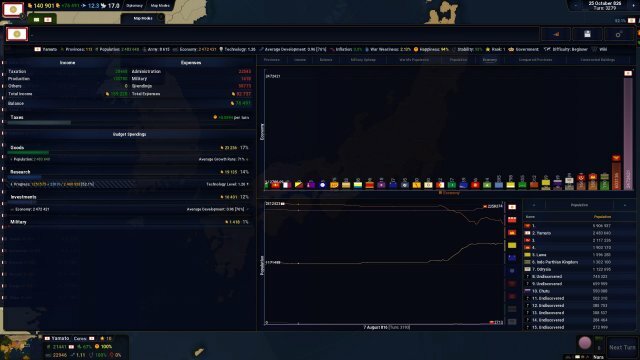 tax is bounded to your population in that province and the production is connected to the economy points and maybe development level. At the beginning, when you have limited cash, tax will be your major income. Thus a kingdom with lots of ppl is great to begin with. Besides, you can build library on a high poped province to gain large research points and boost your tech. But you dont want to pick a super large kingdom or empire, as theres an administration cost for each province. 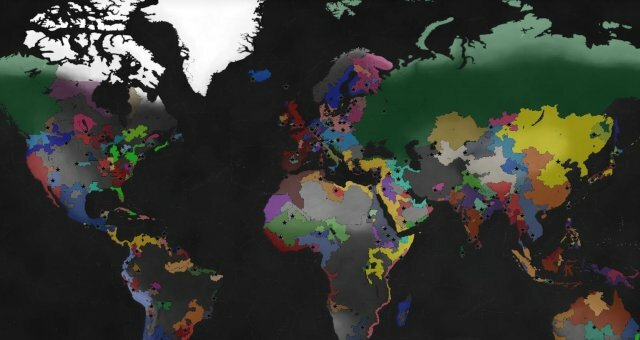 (plus its less chanllenging to play an already large empire such as roman empire) A medium sized kingdom with high pop, fair economy and good starting tech level kingdom will be great . Scotland in 1440 AD scenario and yamamoto in 5 AD scenario are good examples. The screenshot shows the income of my yamamoto save, it has 100 provinces but gets 70k+ income per month. The major income comes from production. At beginning, you want to lower all your expense on both goods, taxes, investment and military to gain a maximum possible income. and spend all your treasury to invest a high poped and good starting economy province, like edynburg in Scotland. It will take several turns to complete, and you will see a 10-30 income increase as it is constructing. Once it completes, you just simply reinvest it again. During this process, you may also want to construct the library and workshop in this province. But be aware, once your economy points is close to your population in this province, the income increasement per investment starts to get lower. Basically you just dont want to make it higher than the pop in the province. Now, you can start investing on other provinces. During this process, you may also want to construct farms and research buildings on other provinces. The more ppl you have, the more tax and research point you will have. 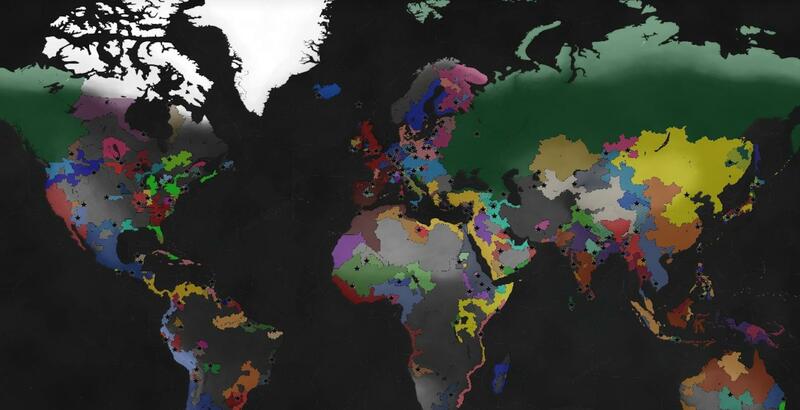 Once you completed this on all of your provinces, you can start to conquer the world even with very few provinces.